Jimmy K. asks: Why is there a plastic bag attached to airline oxygen masks if they don’t inflate? 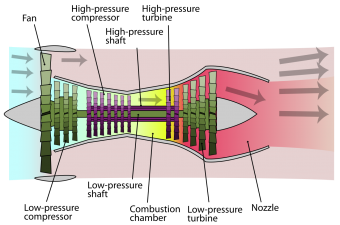 Because the economics of having large oxygen tanks aboard airliners simply doesn’t work out (not to mention that the air quality inside the plane would rapidly become unpleasant if fresh air wasn’t constantly supplied, regardless of the oxygen levels), commercial airplanes have a very clever system installed to solve the problem of ultra-low pressure atmosphere at cruising altitudes. 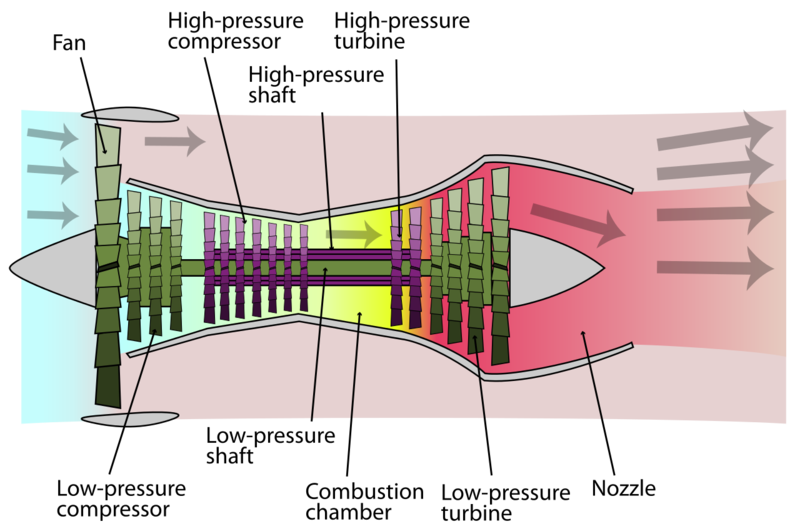 In most modern airliners (the Boeing 787 Dreamliner not withstanding), outside air is “bled off” from the compressor stage of the turbine engines and eventually piped into the passenger areas. However, a bit of processing is needed first as the compressed air is extremely hot (on the order of nearly 400 degrees Fahrenheit or 200 degrees Celsius) at this stage. Thus, before it enters the passenger compartment, it is first allowed to expand and is run through a heat exchanger and air cycle system to cool it off sufficiently. This system also can work as a heater, with some of the hot air mixed in with the cooled air to regulate cabin temperature. Once cooled and filtered, the pressurized air, which now has sufficient oxygen density to keep people happily conscious, is piped into the cabin area, usually at levels around 12 psi (about equivalent to atmospheric pressure at 7,000 feet). Why 12 psi instead of something like sea-level pressures of about 14.7 psi? 12 psi is sufficient for the majority of passengers while simultaneously reducing the structural strain on the aircraft itself over something like sea level atmospheric pressures. This outflow valve opens and closes automatically to maintain a steady pressure inside the cabin, while the entire system is ensuring that fresh air is continually being piped into and eventually blown out of the aircraft. In fact, while many complain of airplanes seeming “stuffy,” this system ensures that all the air in the aircraft is being completely replaced on average every 2-3 minutes. Yes, that means that your car, house or office is likely significantly more “stuffy” than a commercial airplane flying at 35,000 feet. Unfortunately, sometimes planes lose cabin pressure. Whatever the cause, the loss of pressure (usually set at atmospheric pressures past 14,000 ft) will result in oxygen masks deploying. From here, useful consciousness may only last as little as 5-15 seconds, depending on remaining cabin pressure, which is why it’s critical to immediately put your mask on, rather than helping someone else first. You can help them much better when you’re not unconscious or dead. So how do these airline oxygen masks actually work? It turns out, the economics of having a centralized oxygen tank to provide even emergency oxygen for passengers likewise simply doesn’t add up. Similarly, having tiny individual pressurized oxygen tanks also isn’t feasible. In fact, these masks aren’t hooked up to any tank or air line at all. So how are you able to breathe oxygen through them? That’s right. What you breathe through the mask didn’t begin as pure oxygen. Rather, the plane is equipped with numerous small chemical oxygen generators (also known as “oxygen candles,” about the size of a small package of tennis balls) which contain a mixture of mostly sodium chlorate (NaClO3), less than 5% barium peroxide (BaO2) and less than 1% potassium perchlorate (KClO4). When these chemicals are heated by the lead styphnate and tetracene, each undergoes a reaction that ultimately results in a fair bit of filtered, life sustaining oxygen running through the tube to you. Of course, you might also smell a faint burning odor, but this is nothing to be alarmed about; it just assures you that the system is working. In fact, if the plane is actually on fire, the masks usually won’t deploy, so as not to make the fire worse with the extra oxygen. This brings us to the question of why the plastic bag on the breathing apparatus won’t necessarily inflate as you’re using the device. More than just cosmetic, the bags serve as something of a reservoir for oxygen. If you aren’t taking a breath at all (and have a good seal with the mask tight against your face) the bag keeps the precious, continuously flowing oxygen from escaping into the thin air around you, enabling more of the collected oxygen to be taken in when you do take a breath. When this is happening, or you are breathing out with the valves on the mask releasing much of the used air, the bag may begin to inflate as oxygen collects. When you breathe in, it will deflate. Even if you have a good seal, however, the rate at which the oxygen is generated is often not enough to fully inflate the masks’ bag before you take deep, potentially panicky breaths, deflating it. This is simply because the oxygen generation isn’t on-demand (for the passengers anyway), but simply a continuous-flow production of oxygen. Despite the potentially slow production, the chemical oxygen generators do provide oxygen at a sufficient rate to sustain passengers, generally designed such that peak oxygen production occurs right away (when the plane may be at very high altitude) with the oxygen production rates tailing off over the course of approximately 12-20 minutes before the system burns itself out. This should be long enough for the pilots to get the plane low enough so that the air pressure is high enough for (relatively) normal atmospheric breathing. And if you’ve ever been lucky enough to be in this sort of situation, you know that those pilots can get the plane from altitudes like 35,000+ feet to safer atmospheric levels alarmingly quickly in an emergency; while it may not be literally true, it at least can seem like roller coasters have nothing on them, which is a good thing in this case. As a result of the way the system works for pressurizing the airplane cabin and keeping a steady supply of fresh air, the humidity levels are ultra-low, making it so you dehydrate very quickly on flights. Particularly for long flights, it’s critical then that you drink plenty of fluids. This ultra-low humidity level, combined with the low cabin pressure, also reduces your sense of taste and smell by as much as 30%, which is why airline food generally tastes so bland. To try to compensate for this somewhat, many airlines make sure their food is much more strongly flavored or spiced than you’d normally find appetizing. 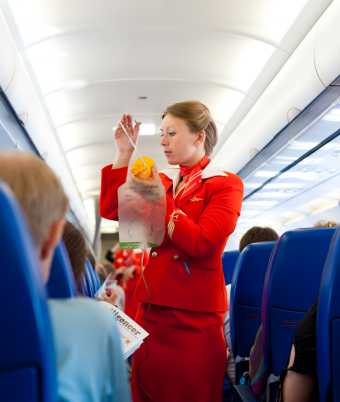 Why Don’t Oxygen Mask Bags Inflate?